In 2018, Solent Concert Orchestra was changed from Marchwood Orchestra (formed 1989), to reflect the wider geographical reach and more extensive programme that the orchestra was achieving. 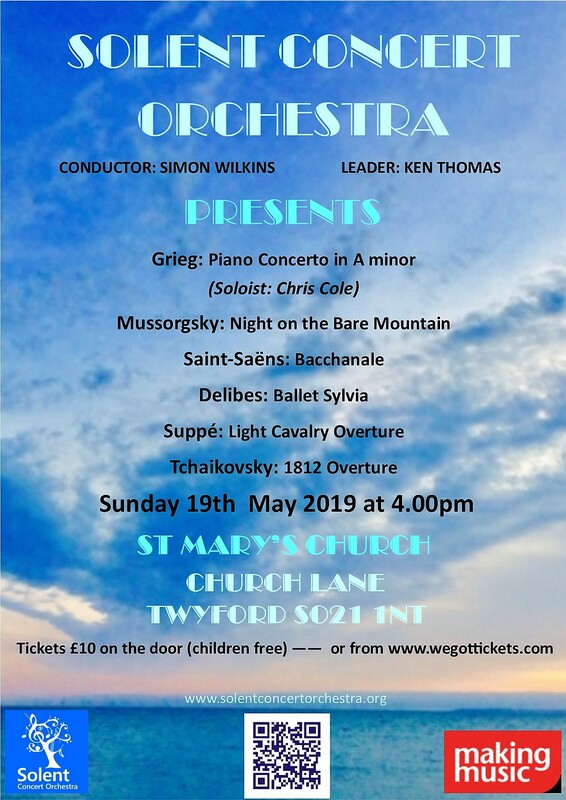 Marchwood Orchestra started as a group of enthusiastic, amateur musicians who originally performed and accompanied services at St John’s Church, Marchwood, almost 30 years ago. Musicians performed both solo and ensemble pieces for their first concert under the baton of Reg Martin. Since then the orchestra has grown significantly and moved to Marchwood Village Hall. Subsequent conductors have been Peter Robson, Tony Kitcherside, Alex Pope and Simon Wilkins, our conductor since 2013. Widening its field along the way the orchestra has performed concerts in various venues in and around Hampshire including churches, schools, village halls and at fetes. The orchestra has donated significantly to local and national charities. In 2009, Marchwood Orchestra undertook a major initiative to form a second orchestra for less experienced players, young and old, named Marchwood Prelude. Under conductor John Bell, Prelude thrived under this format, starting as a smaller group, performing a small number of pieces in the Marchwood Orchestra concerts. Within a few years Prelude outnumbered Marchwood Orchestra in terms of players, and started performing very successful concerts in its own right. Therefore in 2014 the group evolved and took the name of Marchwood Orchestras, becoming an umbrella organisation for Marchwood Orchestra and Marchwood Prelude. In 2017, the two orchestras each became their own separate organisation, Marchwood Orchestra and Marchwood Prelude. This stage of evolution for Marchwood Orchestra became complete in 2018 when it renamed itself Solent Concert Orchestra. This reflects the fact that the programme and geographical reach of the orchestra has extended very significantly from the seed those foundation members of Marchwood Orchestra planted all those years earlier.